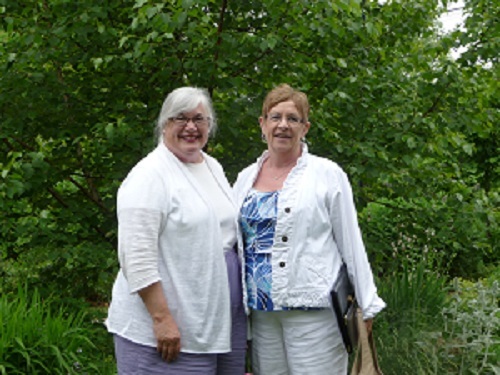 Ann Wilson and Marion Homer from the Harrow, Colchester area visited Wardsville this week. These gals are hot for barn quilts! Establishing a Barn Quilt Trail along 50 highway through the blossoming wine district with Lake Erie as the background seems like a grand project for the citizens of this area. Ann and Marion had a lot of questions and went home envisioning how a Barn Quilt Trail could evolve in time for the War of 1812 commemorative events in 2012. We wish them well and good luck! Posted on June 18, 2011, in Barn Quilt Champions., Establishing a barn quilt trail. Bookmark the permalink. 2 Comments. I look forward to visiting your quilts this summer! Please look us up. Mary Simpson 519 287 3566 in Glencoe, Ontario. We’ll link to your website.